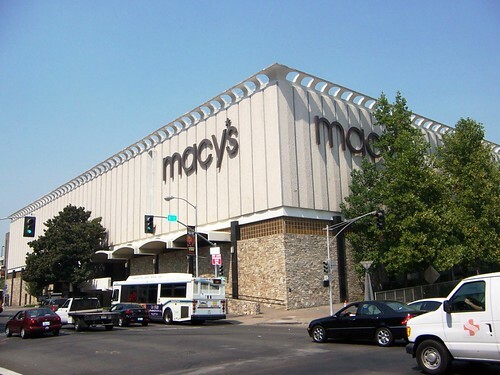 The Big downtown Macy’s at 5th and L is currently the best big department store in the Sacratomatoville. Last Saturday, South Natomas resident Vanessa Daniels needed a blender stat! Her shopping options were the Wal Mart and Target stores in North Natomas off Truxel Road. Both stores are closer but the traffic is a nightmare. The other option was Arden Fair-Traffic Impossible! Her neighbor suggested Macy’s downtown. Vanessa, said she was in and out of the store in 20 minutes including parking. Try that at Arden, Sunrise or the Galleria? Macy’s downtown is the only department store downtown. Macy’s was once an anchor store along with Weinstock’s in the Downtown Plaza. Today Macy’s is the last store standing. The mall has made way for the Golden 1 Center due to open this fall. As a result, there are no crowds in this large building. Other shops are planned for the rebadged Downtown Commons. A renovated Century Movie theaters will re-open this fall with two new theaters. Despite the absence of crowds the departments are fully stocked. Parking is fast and free. Staffing can be sparse but the waits are short. This bliss will come to an end this fall when the Golden 1 Center opens this fall. As for now, Macy’s is the most convenient department store in Sacratomatoville. This entry was posted in NATIONAL, observations, SACRAMENTO, SHOPPING and tagged Downtown Plaza, Golden 1 Center, sacramento, shopping. Bookmark the permalink.